If you're young and retirement is years away, now is a great time to invest. If you follow the stock market daily like I do, you can see that it is in poor shape right now: unemployment, housing data, Europe's recession, the fiscal cliff, earnings disappointments, US debt levels, etc etc etc. This has caused many bear investors to run and pull their money out of the stock market due to economic uncertainty. Should you follow the herd? This is actually the time to consider buying more investments. When investors get worried and pull their money out of the market - stocks, index funds, and ETF prices drop and become more affordable. This is a time for you to consider buying on the sale. If you look at the trend of the market after any crash / recession, it has always been followed by a period of prosperity as markets recover. The worst time to buy stocks is when they are expensive. When everything seems to be going well with the economy, investors have already bought stocks, raising their prices. No one will know when stocks hit "rock bottom" prices, but that shouldn't matter. As long as your retirement is still years ahead, let the pundits whine and talk about uncertainty. When the market is down like this, use it as motivation to invest just a little bit more. Investing can be fun, but should be done in moderation. I recommend investing around 10% of your income until you have your emergency fund completed (6 months of living expenses). That is a reasonable amount of money you can set aside so you don’t go broke over investing. Once you have your emergency fund taken care of, you can consider investing 15 or 20% of your income. Currently with your IRA, you can only invest up to $5000 for the year 2012. With your 401(k) or 403(b), you can invest up to $17,000. That's going to change slightly in 2013. The good news is that you can now invest slightly more money in 2013 in these tax-advantaged accounts. Those under 50, married and filing jointly with a combined earned income of $178,000 or less can now contribute a maximum of $5,500 (from $5,000). Those under 50 who are filing as single or head of household with a combined earned income of $112,000 or less can now contribute a maximum of $5,500 (from $5,000). You can open and fund a Roth IRA regardless of your age, as long as you generate taxable compensation for the tax year. However, you cannot contribute to a Roth IRA if you’re married filing jointly and make a combined income of more than $188,000 or you are single and make a combined income of more than $127,000. The contribution limit for employees who participate in 401(k) and 403(b) retirement plans will be increased from $17,000 to $17,500. You can invest in a 401(k) or 403(b) if your employer offers it. I'm not going to go over contribution changes and catch up contributions if you're over 50 because if you're over 50 and reading this blog, most of my material won't apply to you. Sorry you're too old for me to give advice to. Remember, you can only contribute to your Roth IRA with after-tax earned income. Also, you cannot contribute more money to your Roth IRA than what you receive in compensation for the tax year. For example, if you're only working part time and make $4,500 in tax year, you cannot contribute the maximum of $5,000 per year in Roth IRA contributions for 2012 or $5,500 in Roth IRA contributions for 2013, you can only contribute $4,500. 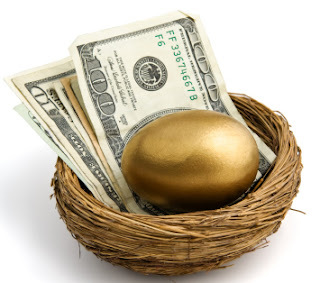 Your deadline for contributing money into your Roth IRA for 2012 is on April 15, 2013. So there's still time to get that $5000 together for the year 2012. The deadline for contributing money into your 401(k) / 403(b) for 2012 is on the last day of this year, December 31st, 2012. Read more about the new retirement account changes here.